Back in February, we felt like we had this job growth thing down, as employment grew to 1,041,500 jobs. That, unfortunately, turned out to be the peak, and employment has declined a bit since then. 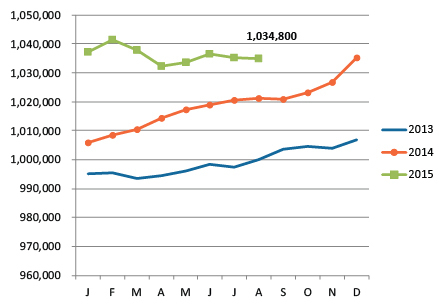 Our August employment total stands at 1,034,800, down by 6,700 from February. 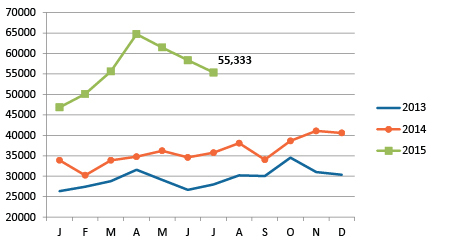 Also, the Bureau of Labor Statistics adjusted the figure we reported for July downward by 4,500. We should keep in mind that we are still well above last year's level, by about 13,000 jobs, but so far 2015 has been less than spectacular in terms of employment growth in Kansas City — a trend not shared by some of our peer metros, as the chart below illustrates. The year still has four months of data yet to be reported, and perhaps we will see a big finish like we did in 2014. 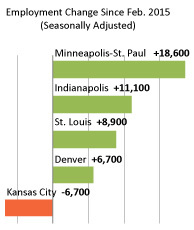 But still, given all the economic momentum Kansas City seems to have, employment remains a puzzling laggard. The unemployment rate dropped to 5.2 percent, but it still remains high relative to our peer metros. Please join us on Tuesday, Nov. 3, at the Kauffman Foundation Conference Center for our annual workforce and education summit, where we'll explore ways to develop a more highly qualified workforce by strengthening connections between industry and education. Our keynote speaker will be Joel Simon, vice president for workforce and economic development at CAEL, the Center for Adult and Experiental Learning. Agenda details and a link for registration are online here. 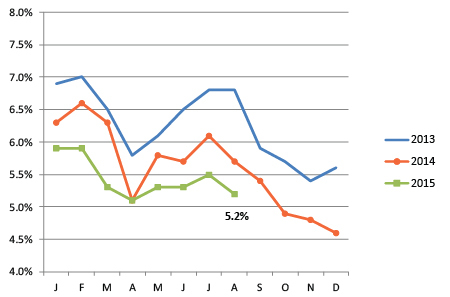 Recent adjustments to employment data indicate a much flatter trend for the region. Kansas City's unemployment rate fell from 5.5 percent in July to 5.2 percent in August. 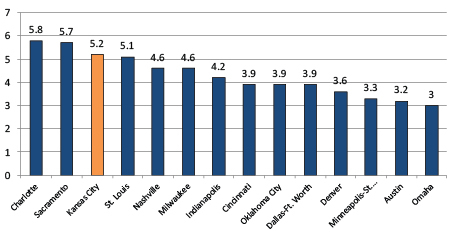 Kansas City's unemployment rate is still higher than most peer metros.